With the Customer Involvement Program (CIP) we have a database of over 60 million commands issued by anonymized users. We start to visualize the product usage by ordering the commands from most-frequently-used to least-frequently-used. The size of the text and length of the bar are proportional to how frequently the command is used. Fig 1. Most frequently used AutoCAD commands. For AutoCAD we can see that the ERASE command is the most frequently used, and it accounts for 14.07% of all commands issued. These bars represent command frequency, but we can also look at command popularity; that is, how many people use the command. Fig 2. 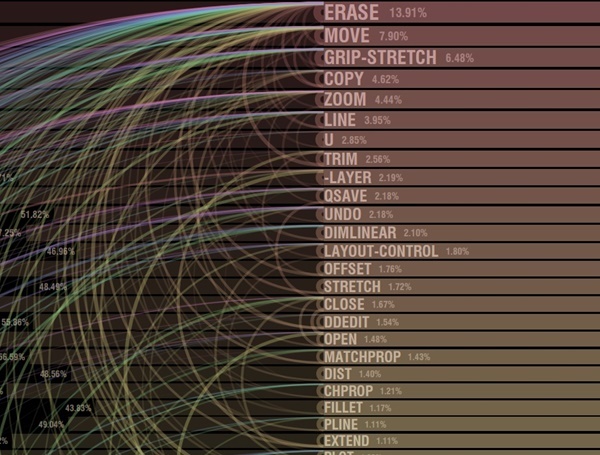 Most frequently used AutoCAD commands with their popularity shown on the left. The lighter coloured bars to the left represent command popularity, and we can see that 90.82% of AutoCAD users have used the Erase command, while only 50.70% have used the Undo command. We can start to see interesting features now such as the U command which has similar functionality to UNDO is used by more people than UNDO, but makes up a smaller percentage of the overall command count. We can also look at which commands are likely to come next. For example, after the ERASE command, the most likely 3 next commands are the ERASE command again, MOVE, and COPY. We show these in text at the end of the bar, but also draw arcs connecting likely next commands. Fig 3. Commands most likely to follow the ERASE command with arcs drawn to connect them. When we do this for all commands, we have a series of arcs connecting all commands with the ones most likely to come next. Fig 4. Command arcs for the top 5 most frequently used AutoCAD commands. For each command we now have a collection of information including how frequently it is used, how many people are using it, and which commands are likely to come next. We present all of this graphically for each command. Fig 5. Data presented for each command. When we stick all of this together for the 200 most frequently used command in AutoCAD, we get an overview diagram of the product?s usage. And not only can we create these diagrams for AutoCAD, but for any Autodesk product with Customer Involvement Program instrumentation, including Inventor, Revit, and 3dsMax. Creating these diagrams from the Customer Involvement Program data helps us spot patterns and trends in how our products are being used and leads us towards improvements we can make in the future. Please send any questions or feedback to Justin Matejka.